The sequel to Rebellion’s highly-acclaimed 2005 game, Sniper Elite, offer gamers an incredibly authentic World War II sniping experience. Sniper Elite V2 places them in the middle of war-torn Berlin amidst a frenzied final battle between Hitler’s remaining SS and advancing Russian troops. • Snipers Choice – Players will often find themselves facing a choice of the perfect shot that leaves them catastrophically exposed or a more difficult route that means they can continue their mission. For more info head over to Sniper Elite V2 Facebook page , not much on the Sniper Elite V2 website as of yet. Mass Effect 3 was the winner of Spike TV’s Most Anticipated Video Game at this year’s VGA’s. Next year just can’t come quick enough for us all! The fifth game in the multi-million selling franchise showcasing IO’s new proprietary Glacier 2 technology. Don’t be afraid to check it out below. Rainbows Back! It’s a long way down for this guy but that’s the least of his problem’s. EndWar– Escalation Expansion Pack, 4 exclusive missions on all new battlefields playable in skirmish mode, 3 exclusive unit upgrades and an extra set of achievements to expand your experience with Tom Clancy’s EndWar™. New missions includes the siege of a firebase in Kursk (Ukraine), the assault on Devon beach (England), the raid on Rota naval base (Spain) and the conquest of Dorsey Knob (USA, West Virginia). Far Cry 2 – Fortunes Pack, Ramp up the terror with the Far Cry®2 Fortunes Pack. Loaded with 3 new weapons, 2 new vehicles and 4 new multiplayer maps. Silenced Shotgun – Power and stealth in one gun. Craftsman Shotgun – An ornamental shotgun with power and class to get people talking. Crossbow – Use explosive bolts to take out vehicles or start raging fires from a safe distance. Head on over to the Xbox Marketplace to see full list. Xbox 360 Fall Dashboard Update. On Tuesday, December 6th the latest update to the Xbox 360 dashboard will be available to consoles around the world. In addition to new and updated features, if you have Kinect you’ll be able to say it and Xbox will find it with Bing Search. If your on of the lucky few to have recieved the update post your thought’s below. Gamers and media aficionados, have no fear. No longer will you need a plethora of drives and other storage devices to be able to have all your games and media at your fingertips. This fall, Microsoft is introducing the largest hard drive it has ever offered for Xbox 360, with 320GB of storage space. 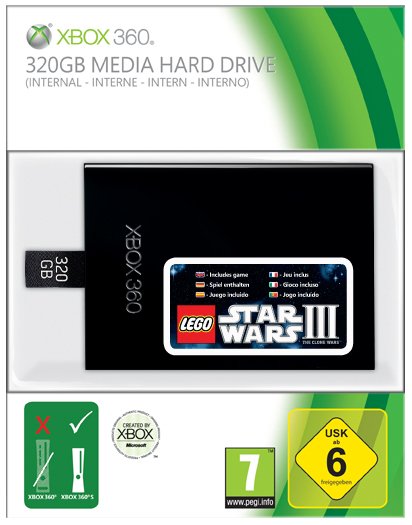 Launching in late October, the Xbox 360 320GB Media Hard Drive will be available for $129.99. (U.S. ERP). It will also include a LIVE download code for the most action-packed LEGO Game yet — LEGO Star Wars III: The Clone Wars from LucasArts, a division of Lucasfilm Entertainment Company Ltd. and TT Games. With more downloadable content than ever, the extra storage of the new 320GB Media Hard Drive is an invaluable add-on. up to 95 full games. The Media Hard Drive is compatible with all Xbox 360 S models and will be sold at at your favorite Xbox 360 retailer and is available worldwide, the Media Hard Drive will not include the game download code in Japan, Saudi Arabia, Slovakia and the UAE.